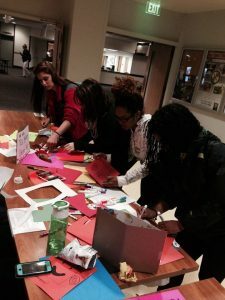 Students at Towson University value and thrive off of diversity and connectivity. They use their skills and knowledge to help others in the community every year. In fact, this last year over 8,955 students completed service hours within and outside of the Towson Community. These activities range from building houses with student groups like Houses for Humanity to gleaning produce for food banks like the TU Student United Way. Students preparing Halloween cards for Pickersgill residents.